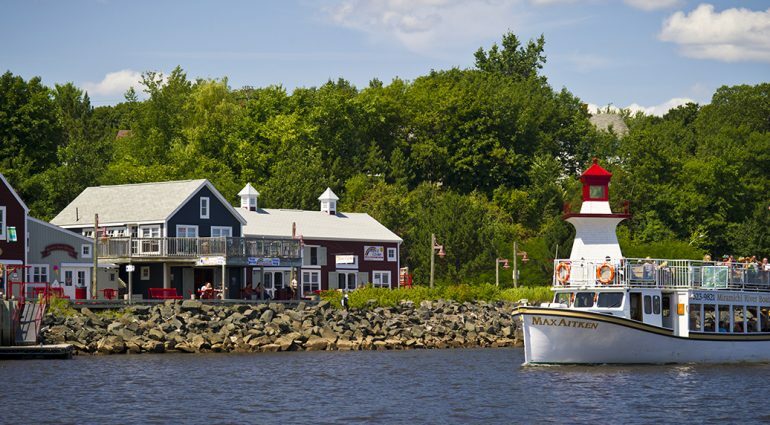 Like much of New Brunswick, Miramichi feels like a well-kept secret. It is a gorgeous spot, but probably not even on your radar as a vacation destination. It totally should be though, because there are many fun things to do in Miramichi and it’s the perfect spot for a laid-back family trip with an old-fashioned feel. Located on the mouth of the Miramichi River, the city has a population of almost 18,000 and sits in gloriously pretty countryside that makes the area popular with outdoor enthusiasts. A lot goes on in and around the river, but there’s also a rich cultural history to explore. When I stayed in Miramichi with my family– in a tree house no less – we ended up having a fabulous break and can’t wait to get back there again this summer. Here’s why you should head there too. 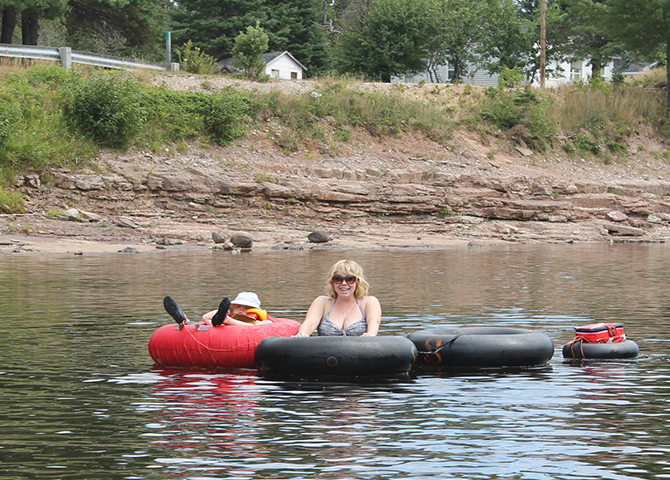 One of the most popular Miramichi activities is tubing down the Miramichi River, the perfect activity on a hot summer’s day. Stewarts Tubing Inc sets you up with tubes and lifejackets, then deposits you at the start of the 6.5km run down the river and picks you up at the end. The ride takes approximately two-hours depending on water levels. Your lunch can also ride the river with you, if you choose to rent a tube for your cooler (we did), and so can good old Fido (that’s right, you can rent a tube for your dog too!). 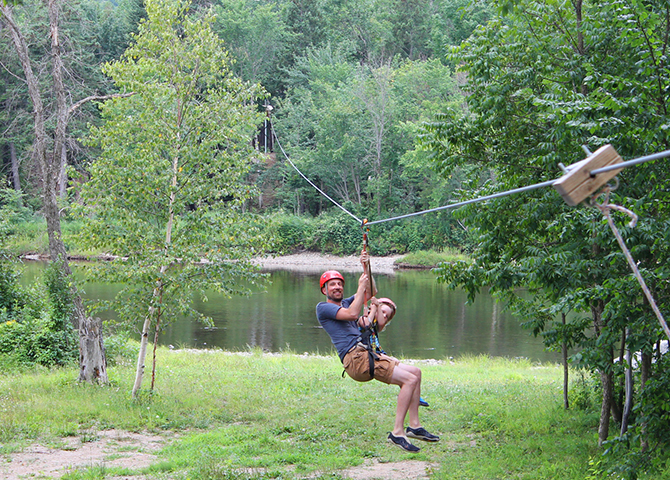 You can also fly over the Miramichi River on the Over the Cove Zip-line – at 350 metres it is the longest zipline in the Maritime Provinces and suitable for even little kids as long as they ride attached to an adult. Want to try your hand at fly fishing? The Miramichi River is one of the best salmon fishing rivers in the world, and there are plenty of opportunities for you to get out there and try it. There are public salmon fishing pools along the Miramichi. 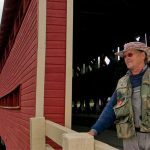 If you’re renting a car while there, head to the charming village of Doaktown (an hour’s drive up the river) where you’ll find the Atlantic Salmon Museum which has a fun kids’ program throughout July and August. While we were there my daughter learned to tie fishing flies and cast a rod, which she loved. The Village Family Restaurant in Doaktown has a superb selection of pies, so stopping there is a must. There’s an excellent nautical themed kids’ playground and splash pad at Ritchie Wharf Park, a quaint area with a row of shops and restaurants on the waterfront (it is a sweet place to grab an ice cream and sit by the boardwalk while your kids run wild). Throughout the summer there’s live entertainment at the park too. You can also take a river boat tour from the wharf, where you’ll learn stories of the city’s boatbuilding past. If you need a proper coffee, then Creative Grounds Café provides, and is a kid-friendly spot to hang out on comfy couches and admire local art. 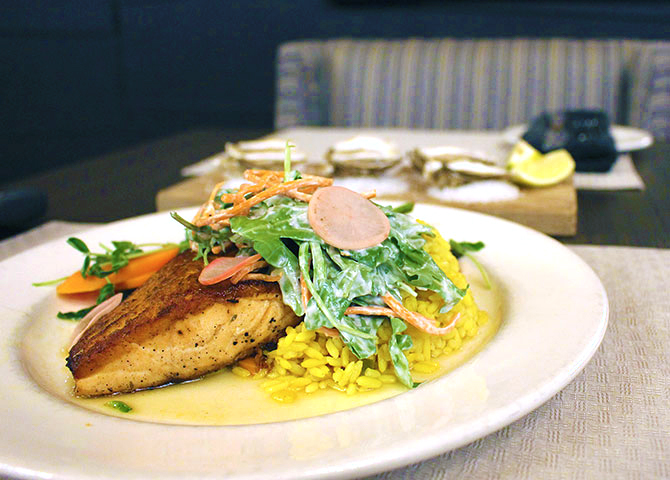 For a posh supper head to 1809, this restaurant at the Rodd Resort serves up seafood (including salmon, naturally) and upmarket local fare. Pick up treats and locally made souvenirs at the Newcastle Farmers’ Market, held every Friday. Miramichi bills itself as the Irish capital of Canada, because a large number of Irish immigrants arrived and settled there after the Napoleonic War ended in 1815. 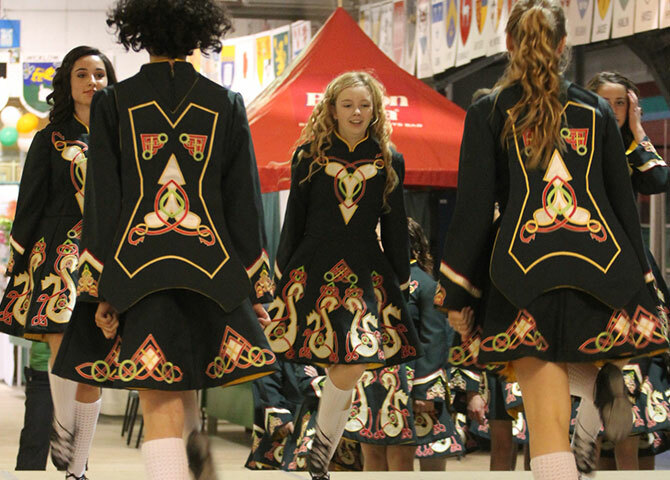 This is celebrated every July, when the Miramichi Irish Festival takes over the city, bringing parades, concerts, and cultural performances. You’ll see Irish flags all around the city, and if you yearn for fiddle music and Guinness poured right, head to O’Donaghues Irish Pub. There’s also a Mi’kmaq cultural heritage centre you can visit at Metepenagiag Heritage Park, a 35-minute drive away. Take a ferry over to Beaubears Island, which is a beautiful spot that holds some tragic histories in its lush woodlands. When the Acadians were kicked out of Nova Scotia, PEI, and New Brunswick during the Seven Years’ War, they took refuge on the island. 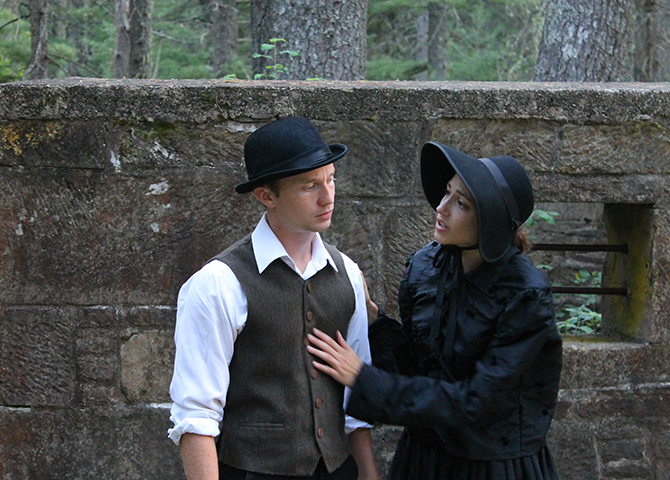 We took an interpretive tour, where actors showed us how the Acadians lived, and died, on Beaubears, and then how the Island became a shipbuilding hub. It is a gorgeous spot, gourmet picnics are available, and they also offer Voyageur Canoe experiences so you can get out on the river. Once you’ve visited Miramichi, you’ll wonder why so few people seem to know about this hidden-gem destination. 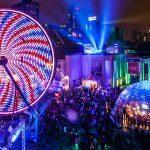 If you take the train there, even better, because the Ocean route from Montreal-Halifax (on which Miramichi is located) is devastatingly pretty and definitely one for every Canadian traveller’s bucket list.